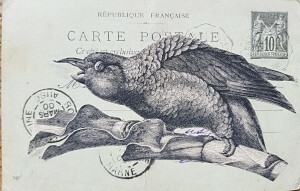 This piece of altered art is a one-of-a-kind, collaged vintage postcard circa 1903, with original stamps and handwritten message in beautiful, oldstyle penmanship. 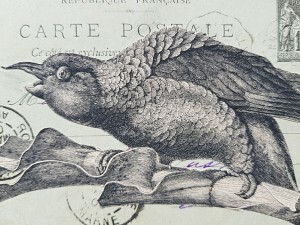 The bird is handcut from a 1912 Swiss, zoological guide. 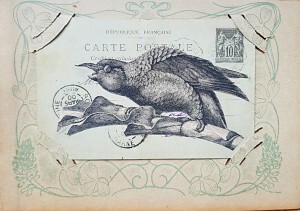 It is “mounted” on a cardboard holder that was in a album of French postcards circa 1920s. These ephemera are all original ephemera and not reproductions. Mounted, this piece measures: 8″ x 5 1/2″ (20cm x 13 1.2 cm). The postcard alone measures 5 1/2″ x 3 1/2″ (14cm x 9cm). "Because there can’t be too much old Hollywood glamour, literary gossip, mystery, stories about food, altered books, or illustrated journals. But maybe that's just me."